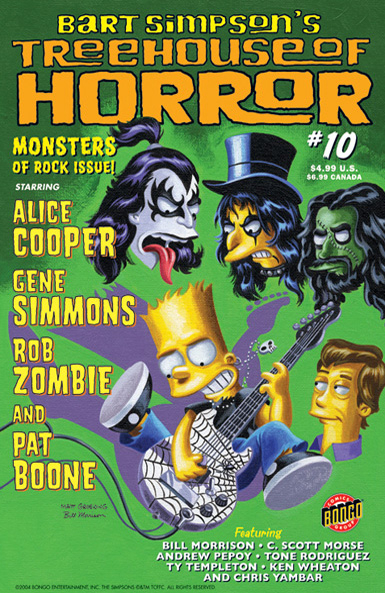 Join Bongo and it's special guest writers––Alice Cooper, Gene Simmons, and Rob Zombie––as they take you on a heavy metal, Halloween-inspired rock 'n' roll odyssey of head banging, heart pounding, tongue-wagging, dead-raising, nightmare-welcoming frights and frivolity guaranteed to blow your mind. And it doesn't get any better than when extra special guest writer, Pat Boone himself, gets into a metal mood and tells a twisted tale of dastardly demons and righteous redemption. The four Monsters of Rock are joined by sidemen Bill Morrison, C. Scott Morse. Tone Rodriguez, Ty Templeton, and Chris Yambar for the Halloween jam of the century! Treat yourself a terrific time of Treehouse inspired terror and rock the night away!